Here are the how to make a wedding cake baking instructions, as well as, icing a wedding cake, stacking a wedding cake, and leveling a wedding cake. My passion is making wedding cakes. Creating a delicious, beautiful, unique wedding cake is a great joy. Round and square are two basic styles of wedding cakes that are popular today. There are so many styles of wedding cakes and wedding cake flowers to choose from; so to make it easy, we will go with a round 4-tier wedding cake for our example. The next decision to make is the size of your wedding cake. How many servings will the cake need to feed? Use the guide below to choose how many tiers and the different sizes of your tiers. If you want that bright white fondant color, then I highly recommend using a fondant whitening powder. It really takes wedding white to a new level. Below is a free video tutorial for how to whiten marshmallow fondant if you make your own marshmallow fondant. If you just want to get it ready made I recommend using a bright white fondant fondant that's available in 30 flavors to complement your cake. The marshmallow and the butter cream fondant flavors are my favorites, but I did like the butter pecan and margarita flavored fondant too! For our example today we will use a 14 inch tier, 12 inch tier, 10 inch tier, and a smaller 8 inch tier for the anniversary cake top. This is a real Indiana Jones wedding theme cake order we are making for our how to make a wedding cake example and our client will need 150 servings plus their anniversary cake. 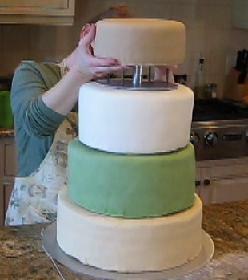 To make the wedding cake stack nicely I try to go with 2-inch increments when possible. A 14 inch, 12 inch, and 10 inch wedding cake adds up to 158 so we will use these sizes and have a little more than requested. Additionally, we will go with the 8-inch for the anniversary cake top just to make it look right. Once you have decided on the style and size of wedding cake you want then start baking a wedding cake! Most bakers use custom cake mixes but there is nothing wrong with using Betty Crocker or Duncan Hines cake mix. I use them sometimes for unique flavors and if you follow the instructions they turn out tasting just fine. There are some tricks I have learned how to make a wedding cake easy that I will share. 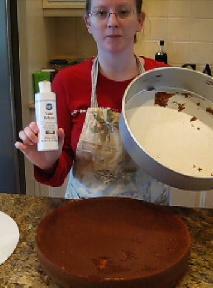 First, use a non stick wedding cake pan or cake release so your cakes won’t stick. 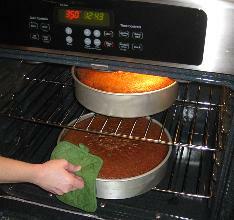 Larger cakes are harder to cook because the outside will cook faster than the wedding cake center. 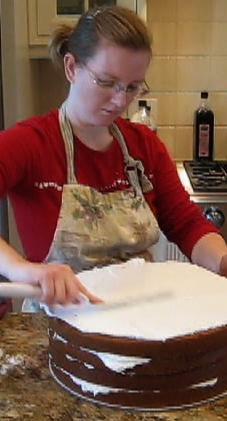 Many bakers take a wet towel strip and wrap it around the pan to slow the cooking around the outside. What I do is about 15 minutes before the cake is finished; I remove the center of my larger cakes no more than 1 inch deep and put back in the oven and I will have a evenly baked wedding cake. 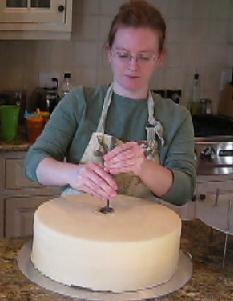 It’s easier for me and I cut the wedding cake tops off anyway to make them level so there is no waste. This is the how to make a wedding cake the easy way. Here is a video example of how to make a wedding cake part 1, enjoy! Once your cakes are done place them on a cake board for support. This is usually a piece of coated cardboard and they are available at Wal Mart, Michaels, and many cake supply houses. If you’re going to do many wedding cakes try online for better pricing. To level your wedding cake trim the top ½ inch or so off of your cake right out of the pan to make them level as possible. 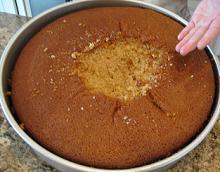 Then I cut the cake in equal top and bottom halves usually about 1 inch thick or so. This is how to make a wedding cake layered and allows you to add filling between them. 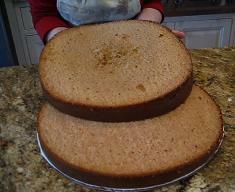 A regular 4-inch high cake pan will give you 2 wedding cake layers so you will need to bake 2 pans to get your height. 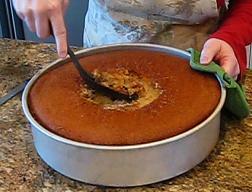 If you use a 2-inch cake pan you will need at least 3 because they will only produce a single cake layer each. Apply your filling of choice (butter cream, mousse, cream cheese filling) on top of your first wedding cake layer then stack the next layer on top and continue this till your first wedding cake tier is filled and topped. Next, icing your wedding cake sides. I use a turntable to make it easier. 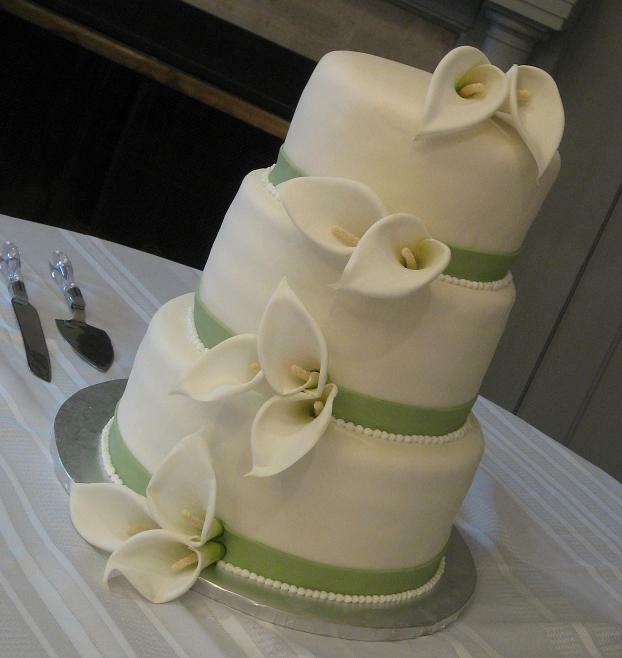 When you have finished the sides use a cake knife or spatula dipped in warm water to smoothing wedding cake icing. Now you are ready to apply your finish icing! Fondant icing is fast becoming the finished icing of choice. In fact, it is now 90% of my cake orders. You can buy fondant at the cake supply store, however it doesn’t really taste good. 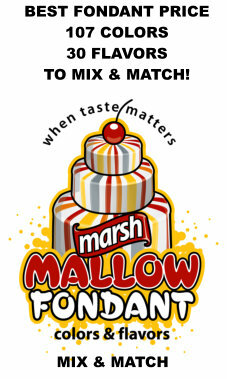 I have had great success with making my own fondant out of marshmallows and it taste great! If you decide to go with fondant visit How To Make A Wedding Cake Using Fondant for complete instructions on how to make fondant and how to apply fondant. Even if you use fondant for the outer cover you will still use icing between the layers and outside the cake to make the fondant stick. Once you have your cakes covered you are ready to stack your wedding cake. Before wedding cake stands, cakes were either single tier or two cakes stacked on top of each other. 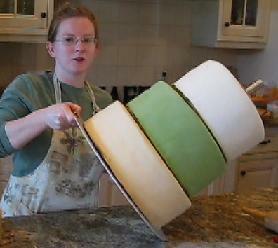 Seldom were cakes stacked over two tiers high because of the difficulty of cutting them level and the weight of the top cake crushing the one below. The next evolution in stacking a wedding cake was the wooden dowel. Wedding cake decorators began using wooden dowels each hand cut exactly to match the height of each cake tier. 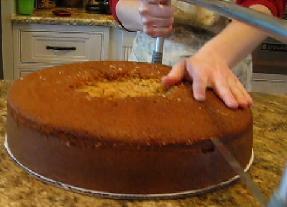 Then placing the dowels in each cake below would support the cake above. The dowel showed the cake decorators how to make a wedding cake three or four cake tiers high. Then came the wedding cake stand. Holding cakes separately using columns to carry the weight of the cake above allowed even taller wedding cakes. This column stacking system remained popular for over a century. Columns represented wealth and stability and were used not only in making wedding cakes, but also in construction of buildings. These wedding cake stands are still used today, however the more modern cake stand look and style has returned to the stacked cake look. Making a wedding cake looked stacked shows off the wedding cake instead of the wedding cake stand. Modern cake decorating classes are going back to teaching how to make a wedding cake using dowels for supports. How to make a wedding cake straight and level is very difficult even if your dowels are exactly the same because a cake is inherently not exactly level. 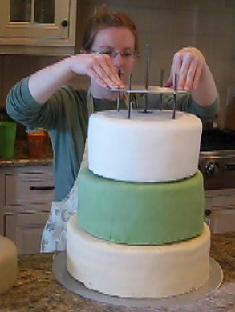 Much practice is required to perfect the technique of stacking any more than two tiers. Once you get higher than that, small differences become amplified as you go taller. Transportation of the cake is also difficult and usually stacked cakes are delivered separately and stacked and piped at the wedding reception venue. Finally, they developed a support system specifically for the stacked cake look. 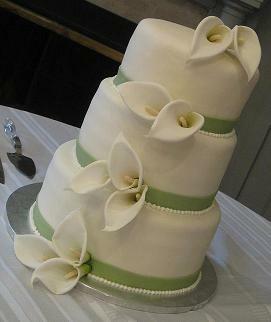 After the cakes are in the wedding cake support system you can actually turn the cake sideways and it remains intact. There are many variations you can assemble this wedding cake stand for cascading, offset, stacked tiers, or spiral. We use the Cake Stackers wedding cake support system on all of our stacked wedding cakes and deliver them safely to the wedding venue with no set up required. We stack and decorate the cakes here, then just deliver. 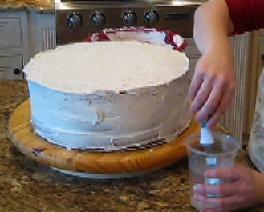 Here is a video example of how to make a wedding cake part 2, enjoy! 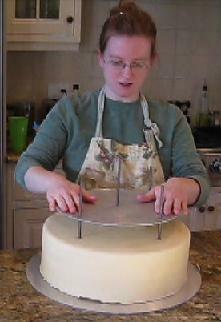 I use the precut cake boards that are available with the stand so I don’t have to cut them myself. 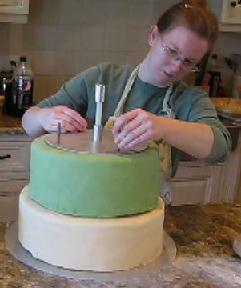 First measure the height of your bottom wedding cake tier and assemble your center post to that exact height. 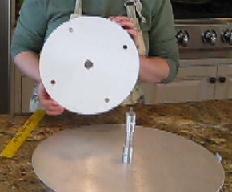 The center post screws into the center of the base plate. 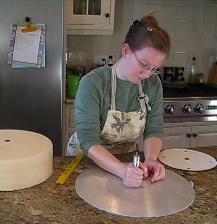 Set your first tier on your wedding cake base plate. It will line up centered because of the hole in the cake board. Next screw in your guidepost so that your second plate lines up exactly centered. Push your second plate into the base wedding cake tier and attach your next center post that you have assembled to the height of your second wedding cake tier. Adjust the stainless dowel screws down until they touch the base plate. Repeat this process for each cake tier until you have reached the top anniversary cake tier. I don’t usually cut the top tier all of the way through and use a shorter center post for my top tier only. You can add a top plate and secure the top of your cake so that if you turn it sideways or completely upside down the cakes will not fall off. This cake support system is by far the safest way to transport wedding cakes. Finally, you can decorate your cake. The sky is the limit with flowers, candies, toppers, zebra stripes, or however you wish. 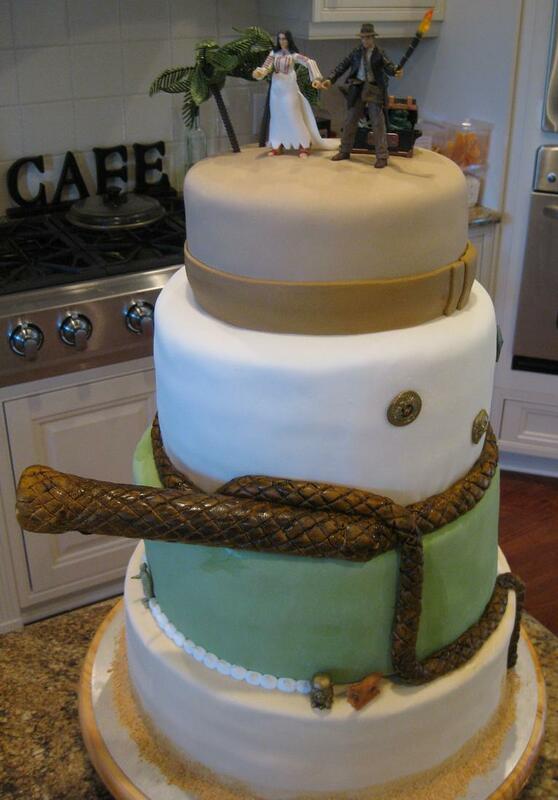 Here is our finished Indiana Jones theme wedding cake we made together! Best of luck and let me know if you have any questions about how to make a wedding cake.